Home>>iPad/iPhone/iPod Transfer>>How to Fix iTunes Backup & Restore Problem? How to Fix iTunes Backup & Restore Problem? While Apple does offer the option to keep all your collections on their iCloud, cloud storage solution, people use iTunes local backup most times as it is more convenient and personalized. But, there are a couple of iTunes backup and restore problems that you may have to overcome to be able to enjoy the feature seamlessly. Thus, in this article, we have collected and picked up several the most frequently asked qustions about iTunes backup or restore for iOS users' reference. 1. iTunes could not backup iPhone? 2. Backup file couldn't be saved on your PC? 3. Not enough free space available here? 4. iTunes doesn't recognize your iPhone, iPad or iPod? 5. The problem between iTunes & security software? 6. iTunes backup file is corrupted or says incompatible? 7. Not enough space to restore iPhone or iPad? 8. How to fix a corrupted lockdown folder? 9. iTunes fails to sync files with iOS devices? 10. 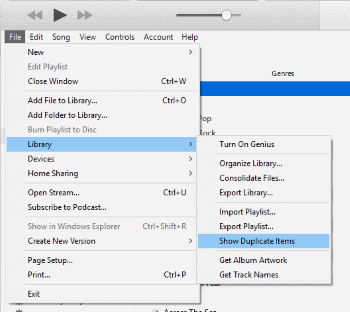 How to delete duplicate songs within iTunes? 13. Firmware is not compatible with iPhone? 14. What if iPhone does not show up in iTunes? 1. iTunes could not backup iPhone? Sometimes when using iTunes to back up your iPhone, you may receive such messages as "iTunes could not back up the iPhone "(name)" because the backup could not be saved on the computer", or a “session failed", with a suggestion that iTunes backup fails. 1. Update iTunes - check it out to see whether you have updated to the latest version of iTunes. If not, download the latest one and then try again. 3. iTunes alternative to backup iPhone - if all the solutions cannot fix the backup issue, then you are suggested to get an iTunes alternative to backup iPhone. Here, you can fully rely on this Coolmuster iPhone Data Manager (Windows/Mac) software, which allows you to easily backup files from iPhone to the computer without any hassle. With this software, you can also backup other files like photos, videos, apps and many more as you wanted and needed. And using it is just a matter of a few clicks and following the exact steps as instructed. 2. Backup file couldn't be saved on your PC? The most common and repeatedly reported issue is the software not being able to save the file on your computer. Try these simple steps. - Consider restarting both your iOS device as well as your computer which might make it work. - Check if the latest version of iTunes is installed on your PC. - If you have security settings at the highest level that prohibits a backup, lower or disable them for the time being. - A complete reset for the lockdown folder could work. - Sometimes, the same names for backups result in problem. Find the backup folder and rename it. For Windows users, it’s found within App Data while Mac users should head to Library -> Application Support. 3. Not enough free space available here? - Start with basics. Check if your computer really have enough disk space to create a backup. - Restart your iOS device and the PC. - In some cases, even changing the connecting cables could make this work. Try it. - An alternative is to create an iCloud backup and save it on a local drive to skip this issue. 4. iTunes doesn't recognize your iPhone, iPad or iPod? - Double check the process by connecting your iOS device with a different USB port. - Locate your computer on your iPhone and click on "Trust this Device" option. - Check if Apple Mobile Device Support software is installed on your PC. If not, install it. - If it still doesn’t work, you have to put your phone or tablet in recovery mode. - Recovery mode wipes your data clean. Take a backup before your proceed. - Turn off your device. Now, hold the home button and connect it to your PC using the USB cable so that it turns on in recovery mode. Many people have met the problem of iTunes can't be launched well or your device can't be detected by the iTunes. It is no doubt that there are lots of reasons result in the mentioned situations, sometimes the incompatible between your iTunes and security software is also one of the main reasons.So how to fix the problem between iTunes & security software could be crucial for people who wish to make full use of the iTunes. Below is the simple steps to resolve the problem between iTunes and security problem, but if you wish to know everything about them, you need to read this article for details: how to fix the problem between iTunes and security software. - Start by making sure your computer has the latest date, time and is synced with internet servers. - Update your security software. - Access iTunes as an administrator and not as a user which might cause similar issues. - Uninstall your security software or antivirus suite before you try taking a backup again. It usually make things work. - Some security programs don't go easily. Use a cleanup utility to completely uninstall as they could interrupt with permission issues. 6. iTunes backup is corrupted or incompatible, what will you do? - Confirm if a backup exists. Open iTunes, go to preferences tab and open devices. - If you have a backup folder on it, your file is indeed there. If files are corrupt, using third party software could help. - For corrupted files, try using deciphertools, iExplorer or iBackup viewer which could help fragment the backup files to make them work again. - Delete the existing backup file and restore it one more time from the source. - To manually delete your file, locate it within app data, roaming, apple computer inside mobile sync. - Common troubleshooting steps like replacing USB cable, restarting devices and updating software could work as well. 7. Not enough space to restore iPhone, iPad? - An obvious way is to check if your iPhone or iPad has enough storage space left. If not, delete any unused files and apps to free space. - Download and install the latest version of both iOS as well as the iTunes software. - Restarting always helps. Restart all your devices once and try one more time to see if it works. - Security settings on your device could cause it. Disable them and try restoring again. 8. How to fix a corrupted lockdown folder? - A corrupted lockdown folder could cause a lot of problem. You have to find it and fix it. - Enter the command %programdata% on the search bar in Windows 8. - In other Windows versions, enter the same command in the Run command dialog box. - Locate the folder named Apple and open it. - In order to delete the lockdown folder inside this folder, you have to be logged in as an administrator. Trying it as a local may leave traces leading to further problems. - Some users suggest that using an alternative to itunes could work but it's not reliable and safe to do so. 9. What if iTunes fails to sync with iPhone/iPad/iPod? - Update your iPhone/iPad/iPod to the latest version (Settings > General > Software Update). - Update iTunes to the latest version and then relaunch iTunes. - Get your iPhone/iPad/iPod linked to the computer with a USB cord, even if you choose Wi-fi syncing. - Select the device within iTunes, uncheck Wi-Fi syncing and choose the option of "Prevent iPod, iPhone and iPad from syncing automatically", then click "Apply" to continue. - Quit iTunes, disconnect the iOS device from the computer, and restart the iPhone, iPad, or iPod touch. - Relaunch iTunes and reconnect the iOS device to the computer with USB again. Then choose your iOS device. - Now, re-enable Wi-Fi syncing, then click "Apply" option again. - Try to sync iTunes files with the iPhone, iPad, iPod touch as usual – syncing should work now. 10. How to delete duplicate songs within iTunes? - Turn iTunes Match off on your device. - Now turn iTunes Match on. And all duplicate songs will be deleted. - Open the Music app on your device to check. You will now see a promo dialogue indicating that you can download music songs from iTunes to the device! - Open iTunes and connect your device to it. - Click Music option > click View on the sidebar. - Choose "Show Duplicate Items" from the drop-down menu. - Right click or control click the duplicated songs > click Delete from the drop-down menu. Then all the duplicate music songs will be deleted within iTunes. Note: When you first connect your iOS device after clearing your duplicates, you may see an dialog requiring you whether to transfer the items from iTunes to your iOS device or not, remember to choose "Don't Transfer" option. 11. iTunes crashes when syncing to idevices? - While opening the iTunes and click Continue option, hold down Shift–Control until seeing a reminder "iTunes is running in safe mode". Now, check whether the problem has been fixed. - If not, create a new user account by choosing Start > Control Panel > open Add or remove user accounts > select Create a new account. Then follow the instructions to finish the process. Till now, this problem will have been solved. But if it still shows up, you are suggested to turn to Apple Team for help! - Open iTunes on your Mac or PC computer and ensure it is of the latest version. - After that, press and hold the Sleep and Home buttons for about ten seconds until it enters recovery mode. Following that an Apple logo will appear. - Now, a promo dialogue will pop up on the computer asking you whether to restore or update your iPhone. Click on Update option to continue and erase all setting and content from your device. - Finally, iTunes will update or restore your iPhone device. Then you can reboot your iPhone device. And now you are free to restore iTunes or iCloud backup files to your iPhone without any difficulty. 13. Firmware is not compatible with iPhone? After getting all the steps done in the above tutorial, you still find your iPhone is stuck on preparing iPhone for restore? Then it might be something wrong with the firmware files. - Restart the computer and then try again to restore iPhone device. - Disable the Antivirus program on your computer. - Make sure you've installed the latest iTunes on the computer. When linking my iPhone to the computer via the USB cord, my iPhone gets detected and displayed on my computer cause I can access all the media files saved on my iPhone camera, But when I run iTunes on the computer, my iPhone does not show up iTunes. So what's wrong? Such case sounds a little bit familiar to you? So how can you solve this problem? - Go to Start menu from the computer. And then type Services.msc to continue the process. - Under Services tab, locate it and then start it if it is stopped or restart it if it is running. - Now, restart iTunes and you will see your iPhone is shown in the iTunes. And if unfortunately it still fails, follow the below solutions. - Open Start Menu, right click on Computer and select Manage option. - You will then go to the computer management interface. 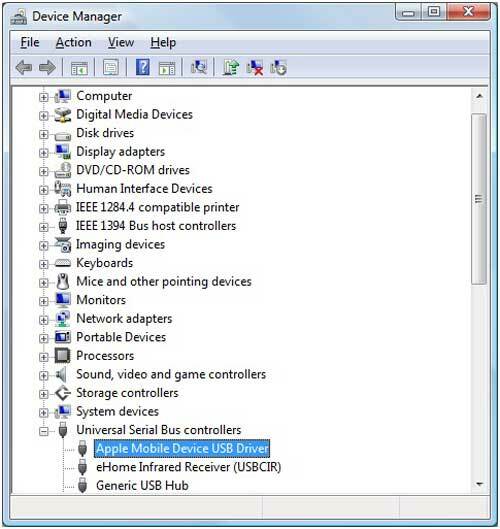 - Click on the Device Manager option shown in the left tab. Find and maximize Universal Serial Bus controllers. - Then right click on the Apple Mobile Device USB Driver option. Click on Uninstall option. If it doesn't work out, unplug, replug you it again. Then the problem could be solved, in theory. And if still fails, go to iTunes website to download the latest iTunes version and start it over. Many of the frequent backup and restore issues found in iTunes can be solved by restarting your device as well as the computer or Macintosh machine. Common hurdles that cause these problems include a defective USB port, older versions of the iTunes among others. Always keep your software up to date to avoid such situations and backup with ease. Another frequently found issue that users tend to overlook is having enough free space, both on their iPhone or iPad as well as their computer. Lack of space could sometimes cause absurd problems which can be easily solved by simply deleting some of the files and retrying the restore or backup function again. At the last resort, always use a different USB cable, a different port or try doing the same process in a new computer. If it works, you could save a lot of time and try fix your own PC at a later time.